Many organizations that are using Citrix have the Enterprise (or the new Platinum) Edition installed. Within these editions the Resource Manager component is available. In an earlier article I already described how you can configure this component, mainly based on the monitor part. Resource Manager also adds all this information in a database for reporting. From Citrix Presentation Server 3 and newer Citrix finally added some report templates that are useful to use. But still much valuable information is still in the database but can not be viewed easily. 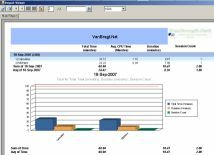 To get this information out you can create your report by yourself with (for example) Crystal Reports, but this is difficult and time consuming process. The company XTS jumped into this space and created the Activity Tracking Manager (ATM). The installation set exists of one CD where the installation can be started via a setup executable. During the installation you need to specify the license key in one of the first windows. The installation also creates an ATM service where you need to specify which account should be used to start this service. When the installation is finished no reboot is necessary. Do not forget that ATM needs the SQL Analysis Services; this should be installed on your SQL server. Before you can use the product a database needs to be available for processing the data. The database can be created on beforehand on the SQL server or during the wizard in the ATM console the database can be created. The database needs to be filled with Resource Manager data before you can create reports. ATM uses the database only for read access so you could connect the RM database directly. But I could also think scenario's with one additional database and a SQL script to synchronize the Resource Manager database with the database created for ATM. Besides the synchronization the data should be processed by Analysis Services. This can be done manually out of the console and scheduled on periodic basis. Also on this database level you create and maintain Groups (based on Application, Servers, User and/or Process) which can be used into the reports. This group can be selected instead of every object individually. When the database is setup and configured, it is time to use the product and that is creating reports. The first step is to configure the overall layout of the report. Via the properties window of the reports component you can for example configure the report header, add a logo, change the color palette used and change the display format of all kind of objects. Secondly is to create the reports themselves. To start easily XTS has a set of example report designs, which can be imported into the product. The example file has lots of different designs included, which you can run directly or edit to your needs. I really like the trends templates, which are very useable for future enhancement of your infrastructure. If the designs are not satisfying your need, there is (logical) also an option to create your own report designs. When creating a new design you are using seven predefined templates. Out of this template you have four focus points: Application, User, Server and Times. (XTS mentioned to me that in V3.8, scheduled to be released on October 2007, has a new focus point on Client IP to create security reports). At least one focus point should be selected into the report (but more are possible). Within the focus points you can select individual objects, the earlier created managed groups or all objects within this focus point. After the focus points the fields can be selected which should be included into the report. If necessary the way the fields are displayed can be changed, for example from minutes to hour basis. Active Directory support is included in ATM out of the box. Most / least used apps, servers, etc. ATM can also include graphs. Therefore you should select one of the focus points and add the necessary fields to the selected graph type. In this design window it is possible to load another design as a kind of template. Into the design also a start and finish date should be selected for the design. Dates can be based on absolute or relative dates. Relative dates are very useful for report designs that are used on a regular basis and are run via a schedule (more about the schedules in the next paragraph). When the design is finished you can generate the report out of this design window to see if the design satisfies the needs. If you are completely finished you should save the design for usage later on. I must say that you should schedule some time to learn the designing process thoroughly. When the design is finished with a few clicks the report is generated. The first page is containing the information explaining the fields there are displayed in the report, followed by the tables and graphs on the following pages. Report can be saved into several formats like PDF, XLS, XML or HTML format. The generating of the report can be automated via the schedule component. This is a very nice feature. You can schedule the reporting of report on a daily, weekly or a monthly schedule. The schedule possibilities are detailed, so the generating of the report can be completely tuned to your needs. Within this schedule you have two possibilities concerning how the output is delivered. You can save the output as a file on a specified directory (in one of the earlier mentioned formats) or directly e-mail the report. To use this last interesting feature you need to specify a SMTP server and an Email Profile. 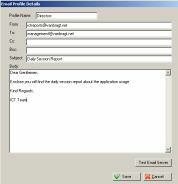 In this profile you can specify the e-mail address(es) where the report needs to be send to and a standard mail body to inform the recipient(s) of the content of the mail. In this way you can easily deliver the needed management information for example. Probably the NR1 reason Resource Manager of Citrix is not used much in the way it is meant is the lack to easily create reports out of the stored data. With ATM XTS has positioned themselves into this gap. With ATM a big set of template designs are delivered which can be used directly. If you need to adjust or create your own report designs it is not completely ready set go. There is definitely a learning curve to create those designs. Because the product does not include a manual with design information this makes it even a little bit more complicated. (There is online help available in the ATM console, a Quickstart guide and some demo's available on the web for the basic steps). As far as I could find it you are limited to the defined fields by the product, but the question is if you need more to reach your goals. XTS gets points for the schedule component to generate those reports and build in mail functionality for sending the reports immediately. If reporting and trend analysis are of big issue ATM can fill in those needs for your organization, but as mentioned before that it is completely configured in 15 minutes. Trend analysis can be created. You do not have full control during the design phase (ATM templates and fields are the basis).